Grab some healthier nut free protein packed Gluten Free Gingersnap Granola Bars for all your snacking needs. 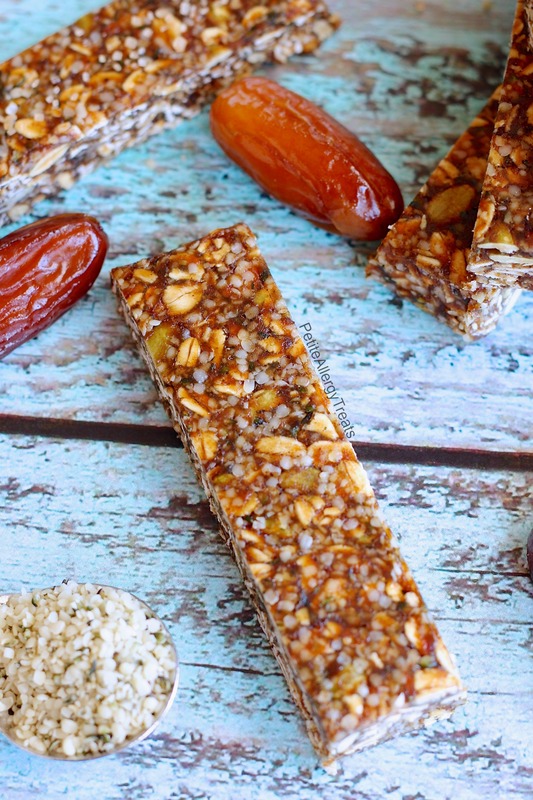 If you love the spice of gingerbread or gingersnaps, this Vegan granola bar is for you! Good ole everyday goals. Attainable goals, I might add. Everyone knows healthy foods are better. The term ‘healthy’, varies to different people. My ideal ‘healthy’ looks more on overall nutrition, things like protein and fiber content. Less refined sugar is an added bonus too. Most ready made bars contain nuts for protein. Nuts are our greatest nemesis for safe granola bars. So where can you get more nut free protein? Seeds are a great alternative to nuts. Many seeds contain the equivalent mineral, protein and fiber benefits of nuts. We have found Mr. Naughty tolerates hemp seeds well. As always, I read labels and called the brand about cross-contamination. Companies many times have shared equipment with nuts. So call the brand and inquire about the production line. Safety first and then open the flood gates for food possibilities. 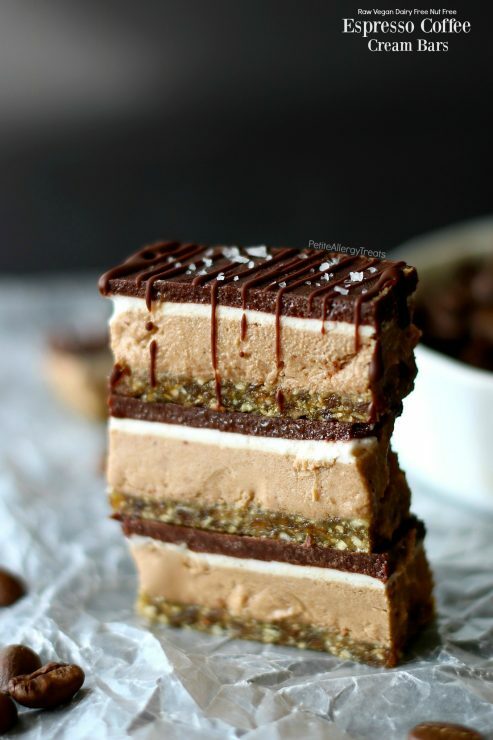 All those peanut butter and nut recipes you see on Pinterest? All fair game. Use seeds instead of nuts. Ready made recipes, easily adaptive to food allergies? Sign me up. 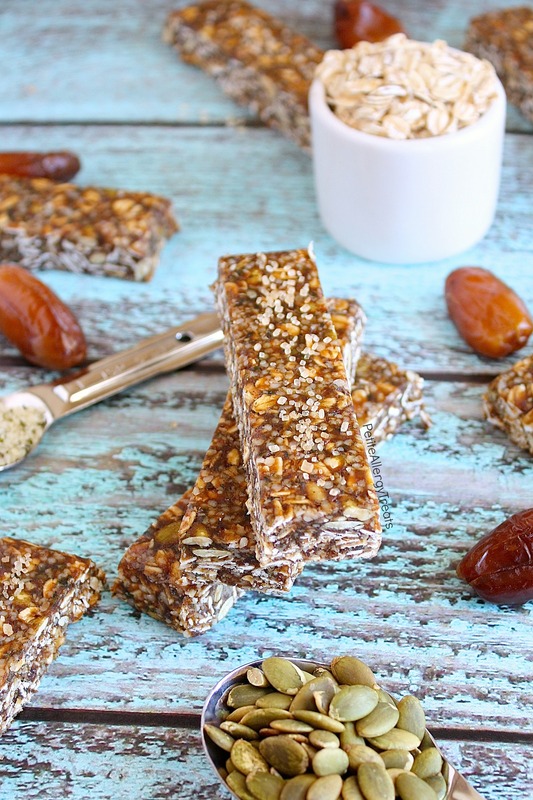 Here’s a nut free recipe your kids will love: Gluten Free Protein Gingersnap Granola Bars made with hemp seeds, pumpkin seeds and dates. My boys love our mild gingersnap cookie flavor. 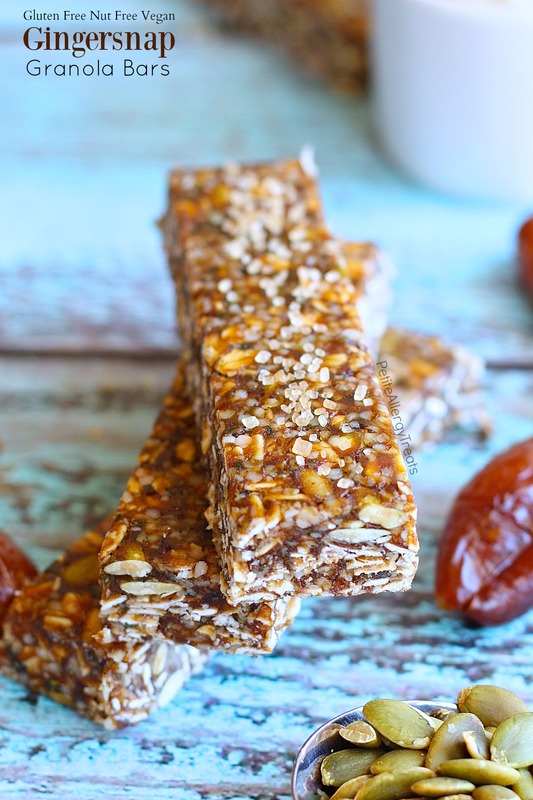 These granola bars are almost refined sugar free, sweetened with dates and maple syrup. The touch of molasses really brings the gingersnap flavor! 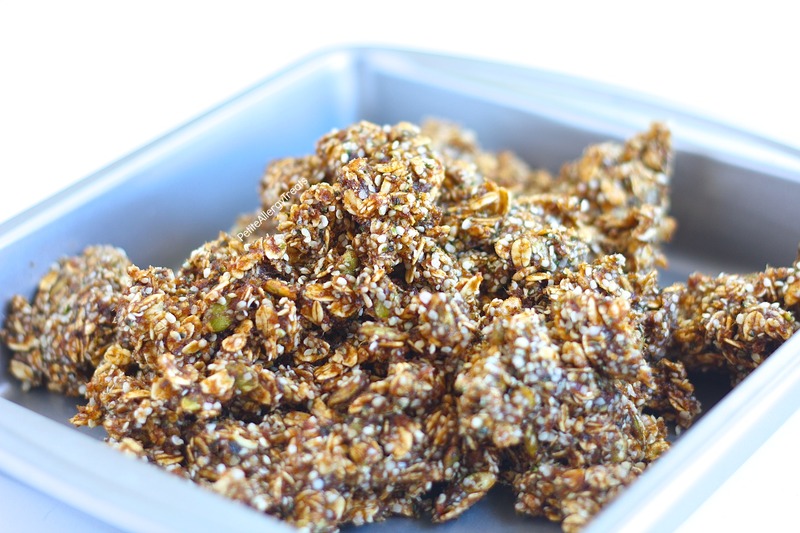 Combine oats, hemp seeds, pumpkin seeds and spices in a large bowl. Mix and set aside. Combine water dates in a sauce pan. Bring water to a boil, mix and smash dates with a wooden spoon (dates will still be hard and won't fall apart yet) . Reduce heat to a simmer cover for 5 minutes. Add maple syrup, molasses and coconut oil. Continue to stir until bubbling and hot. Carefully pour over dry ingredients and mix to evenly coat. Allow to cool 5 minutes. Press granola mixture into an 8 x 8 pan. Sprinkle with demerara sugar. Chill in refrigerator and cut into 16 equal bars. 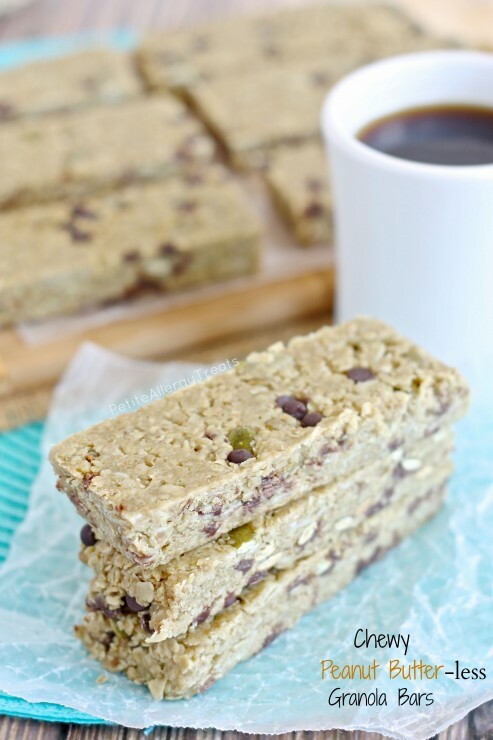 The granola bars are best straight from the refrigerator. 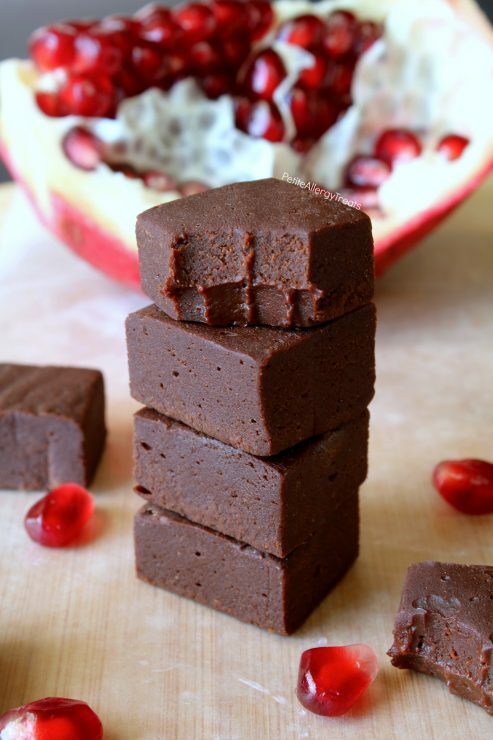 The bars become soft at room temperature but still taste amazing! Be mindful of the source of hemp and pumpkin seeds. Many manufacturers use shared equipment with nuts. As a precaution, I suggest calling the brand of seeds to find their manufacturing habits.